Amanda Barnhart took the CrossFit world by surprise at the 2018 Central Regional, where, as a virtually unknown athlete, she dominated the competition, winning three events and finishing third for the weekend. Her success was no accident: A lifelong athlete, Amanda grew up as a gymnast, volleyball player and runner, and she swam Division 1 at Cleveland State University. Since starting CrossFit in 2013, she’s made four appearances at Regionals, twice on a team and twice as an individual. She is also a practicing Doctor of Physical Therapy, and she works hard to balance time spent with patients and time spent training. She finds that lessons she’s learned in her own competitive athletic experience carry over to everyday athletes and vice versa. Leading up to the 2018 CrossFit Games, she worked hard on her mindset to eliminate any doubt as to whether she belonged among such an elite caliber of athletes. She would finish a solid 15th in her rookie appearance and has been training all year with anticipation of performing even better in the 2019 season. 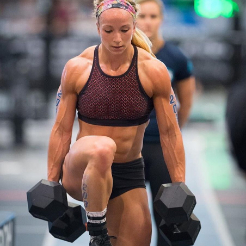 I caught up with her to chat about what has led to her success as a CrossFit Games athlete, what she learned in her 2018 season, and how she hopes to continue to blend her physical therapy and CrossFit careers.